Former South Africa skipper Gary Teichmann has warned the British & Irish Lions that they will to have to contend with more than just altitude in the second Test against the Springboks in Pretoria on Saturday, tipping the home side to tighten up their game and improve up to '30%'. The Lions suffered a narrow 26-21 defeat in the opening Test in Durban last weekend, but were shown to be lightweight in the scrum and also in defence of the Springboks' rolling maul. Adam Jones and Matthew Rees have been called in to shore up the scrum, with Simon Shaw being called in to the second-row. "I think the Springboks will be a good 30% better this weekend," said Teichmann, who played all three Tests against the Lions in 1997. "The Lions have got to be competitive in their scrums but my biggest concern for them is defending the rolling maul. That will be a key area. The altitude means the ball travels a lot further so you will be looking to create more opportunities to drive from the lineout." Teichmann also believes that the Lions will have to improve their finishing, anticipating less opportunities for the tourists this time around. Winger Ugo Monye was guilty of spurning two golden chances and has lost his place in the side to Luke Fitzgerald. "They will also have to be clinical when they get their opportunities. I don't think the Lions will get the same number of try-scoring opportunities as last week," he said. "It will be a tight game with a lot of kicking for territory." Despite the extra kicking control of O'Gara, Teichmann backs Jones' extra defensive solidity to work in his favour, while he also believes that flair players Williams and James Hook should be included in the squad should the Lions need a moment of inspiration. "The Lions have to look at the front row but I don't think there will be too many changes. 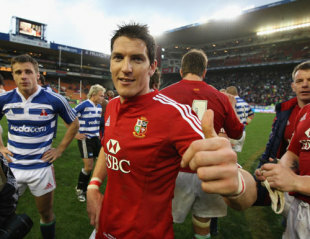 I think they might give O'Gara a go, but Jones' defence against Schalk Burger could swing it back his way," he said. "I don't think they will make changes in the lock or back row and they like the bulk of Ugo Monye. "But I always believe the guys on the bench have to make a difference. I don't believe they should have O'Gara and Jones in the squad. I would prefer Hook. He was playing really nicely until he got injured and although Shane Williams has not had the best tour he is a match-winner."